Underbelly is a selection of sculpture and video that explores the materiality of human and non-human bodies. The work uses materials such as plaster, carpet padding, plastic, resin, silicone, fabric, LCD screens and algae to create abstract forms that bulge beyond borders, slide over edges, and seep through cracks. This exhibition holds tension between the bounded form of a body’s perceived exterior and an unknowable interior world; between control and unruliness. From newfound knowledge of the bacteria that lives in our gut, to medical devices implanted in bodies, to the phones in our pockets, our experience of the world is increasingly hybrid. The contemporary body is a liminal entity; a cyborg, a chimera, a network. It may be thought of as a site of marvel, anxiety and contestation because it blurs categories of human and non-human, inside and outside, organic and synthetic, singular and multiple, sensing and non-sensing. This exhibition reflects Casanova’s ongoing engagement with the Posthuman body as she creates an expanded view of corporeal experience. Through additive and subtractive processes, the body forms itself with and against physical forces such as gravity, energy and entropy. Casanova explores a range of metaphorical constructs for the body such as creature, building, ecosystem–which are inherently subject to transformation. 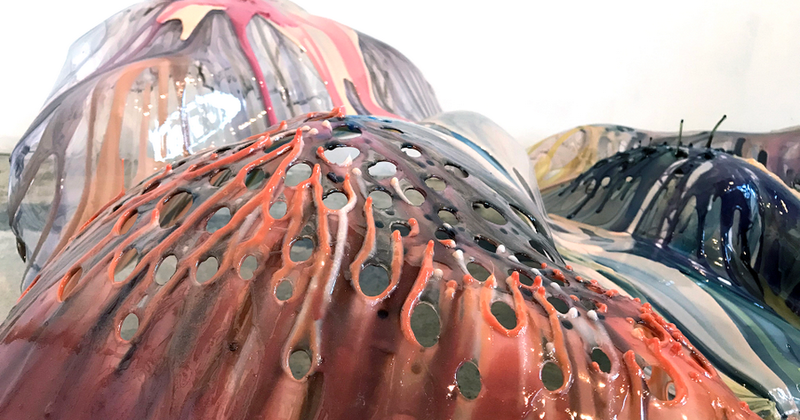 By referencing the forms and materials involved in these processes such as pipes, intestines, wires, veins, rivers, skin, rain, sweat, cells, Casanova reminds us of the processes continually taking place behind walls and beneath our skin. Kate Casanova is an interdisciplinary artist whose work explores the Posthuman body through sculpture and video. Her work is exhibited nationally and internationally at venues such as the Barbican Centre (London), Le Poisson Rouge (New York), and the Weisman Art Museum (Minneapolis). She is represented by the Kolman & Pryor Gallery (Minneapolis). She received an MFA from the University of Minnesota in 2013 and a BFA from the Minneapolis College of Art & Design in 2008. Beginning in the Fall of 2018, she will be an Assistant Professor of Sculpture at the University of Denver (Colorado).